Anya Hindmarch Bespoke is a lifetime of ideas poured into one hundred or so products that have been honed, each to within an inch of its life! This is a very personal project for Anya and is one of the reasons Anya started her own business. Anya Hindmarch Bespoke is about pieces with your name on them, not Anya's; pieces that you would like to pass down to your grandchildren. Bespoke is in some ways, the antithesis of fashion and we think it could help solve the endless dilemma of finding the perfect personalised presents. 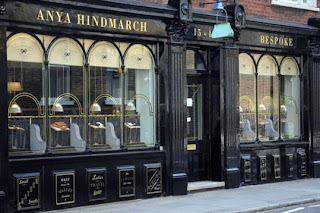 Anya Hindmarch Bespoke will be available exclusively at the new store on Pont Street in London which will be traditional in style offering a very personal service that takes you back to how things used to be at the turn of the century.